If you have trouble with the audio, click here to use a different player. Are you interested in a simple, consistent, easily teachable method for hearing the voice of God on a daily basis? You are invited to listen in as Rev. Mark Virkler, Ph.D., president of CLU, offers an insightful and entertaining introduction to the method he has been teaching worldwide for the last 20 years. This method will allow anyone (yes, even you!) to quickly develop a conversational relationship with Jesus Christ. If you’re more of a visual learner, an overview of the 4 Keys is also available in two written formats below. Every course of study you will pursue here is built around hearing directly from God on a topic and your life being changed by what He tells you. And it all starts with your first course, REN103 Communion With God. I tossed and turned in bed, unable to fall asleep. The thought kept going through my mind: “What if I died tonight? I’m not ready to go to heaven.” Since I could not shake the thought, I got up, went downstairs and waited for my parents to come home from their meeting. When they did, I announced that I wanted to get saved, and they took me straightway to the pastor’s home where he explained the plan of salvation and led me in the sinner’s prayer. I was 15 years old when I accepted Jesus Christ into my heart as my Lord and Savior. It was God’s voice that was speaking to me that night, calling me into His kingdom. His voice came as a spontaneous thought inside my head. However, I didn’t define this as the primary way God’s voice is heard until I had completed a desperate 10 year search to hear Him clearly. Christianity is unique among religions, for it alone offers a personal relationship with the Creator beginning here and now, and lasting throughout eternity. Jesus declared, “This is eternal life – that they may know God” (Jn. 17:3). Unfortunately, many in the Church miss the great blessing of fellowship with our Lord because we have lost the ability to recognize His voice. Though John 10:27 promises us that “My sheep hear My voice,” too many believers are starved for that intimate relationship that alone can satisfy the desire of their hearts. I was one of those sheep who was unable to identify the voice of my Shepherd. I hungered for deeper spiritual intimacy with God, but I could not find it. Then on the eleventh year of my Christian life I had the spontaneous thought that “I should take a year of my life and focus on learning to hear God’s voice.” I decided to act on that thought and devote a year to focused effort, learning to hear His voice. Unbeknown to me, it was the Lord calling me to invest that time. That year the Lord revealed four simple keys, all found in Habakkuk 2:1, 2, which unlocked the treasure of His voice. 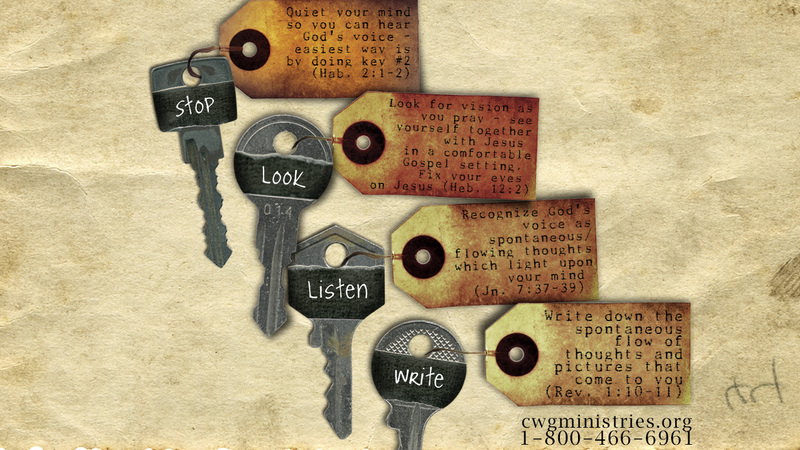 Using the four keys together allowed me to easily hear God’s voice on a daily basis. It was the most transforming step I have taken in the 45 years of my Christian life! I would like to share them with you so you can try them and see if they do the same for you. Key: God’s voice in your heart often sounds like a flow of spontaneous thoughts. Habakkuk knew the sound of God speaking to him (Hab. 2:2). Elijah described it as a still, small voice (1 Kings 19:12). I had always listened for an inner audible voice, and God does speak that way at times. However, I have found that usually, God’s voice comes as spontaneous thoughts, or flowing thoughts. For example, haven’t you ever been driving down the road and had a thought come to you to pray for a certain person? Didn’t you believe it was God telling you to pray? What did God’s voice sound like? Was it an audible voice, or was it a spontaneous thought that lit upon your mind? Experience indicates that we perceive spirit-level communication as spontaneous thoughts, impressions and visions, and Scripture confirms this in many ways. For example, one definition of paga, a Hebrew word for intercession, is “a chance encounter or an accidental intersecting.” When God lays people on our hearts, He does it through paga, a chance-encounter thought “accidentally” intersecting our minds. We consider it chance encounter in that we didn’t reason it up, however it is purposeful, because God sent it to us. Therefore, when you want to hear God’s voice, you tune to chance-encounter, spontaneous or flowing thoughts. Even satan’s thoughts come to us as spontaneous thoughts, which is why we are commanded to “take every thought captive” (2 Cor. 10:5). I am sure all of us have experienced spontaneous evil thoughts coming to us, even attacking right in the middle of our prayer and worship times. So I conclude that analytical thoughts are mine, spontaneous good thoughts come from the Holy Spirit, and spontaneous evil thoughts come from evil spirits. God’s thoughts line up with Scripture and with His various names: Comforter, Counselor, Teacher, Giver of Life, Healer and Deliverer. His thoughts edify, exhort, and comfort. They are pure, peaceable, gentle, reasonable, full of mercy and good fruits, unwavering (James 3:17). Satan’s thoughts line up with his various names: accuser, adversary, thief who comes to kill, steal and destroy. His thoughts condemn and bring despair, rejection, fear, doubt, unbelief and in general, misery. Satan’s thoughts bring jealousy and selfish ambition (James 3:14,15). Key: Become still so you can sense God’s flow of thoughts. Habakkuk said, “I will stand on my guard post…” (Hab. 2:1). Habakkuk knew that to hear God’s quiet, inner, spontaneous thoughts, he had to first go to a quiet place and still his own thoughts and emotions. Psalm 62:5 encourages us to silence our souls before God. There is a deep inner knowing (spontaneous flow) in our spirits that each of us can experience when we quiet our flesh and our minds. If we are not still, we will sense only our own thoughts. Loving God through a quiet worship song is one very effective way to become still. (Note 2 Kings 3:15.) After I worship and become silent within, I open myself for that spontaneous flow. If thoughts come of things I have forgotten to do, I write them down so I can do them later. If thoughts of guilt or unworthiness come, I repent thoroughly, receive the washing of the blood of the Lamb, putting on His robe of righteousness, seeing myself spotless before God (Is. 61:10; Col. 1:22). Clear focus provides the purest flow: To receive the pure word of God, it is very important that my heart be properly focused as I become still because the intuitive flow comes out of the vision being held before one’s eyes. If I fix my eyes upon Jesus, the intuitive flow is pure and comes from Jesus. But if I fix my gaze upon some desire of my heart, the intuitive flow is affected by that desire. To have a pure flow I must become still and carefully fix my eyes upon Jesus (Heb. 12:2). Again, quietly worshiping the King, and receiving out of the stillness that follows quite easily accomplishes this. Beginning my prayer time as Jesus taught us to pray is expedient: “Our Father Who art in heaven, hallowed be Thy name…” Jesus taught us to begin prayer by lifting our eyes up to our Father and beholding Him. We don’t start prayer with our issues. We start our prayer by gazing upon Him! Key: Fix your eyes upon Jesus and ask to receive visions. Habakkuk said, “I will keep watch to see,” (Hab. 2:1,2). Habakkuk was actually looking for a vision as he prayed. Since I believe the Bible is meant to be lived, I decided that I, too, would begin looking with the eyes of my heart into the Spirit world to see what I could see. Do what King David did! A good way to begin using the eyes of your heart is by doing what King David did: “For David says of Him, ‘I SAW THE LORD ALWAYS IN MY PRESENCE; FOR HE IS AT MY RIGHT HAND, SO THAT I WILL NOT BE SHAKEN” (Acts 2:25 NASB). The original Psalm makes it clear that this was a decision of David’s, not a constant supernatural visitation: “I have set (literally, I have placed) the Lord continually before me; because He is at my right hand, I will not be shaken” (Ps. 16:8). Because David knew that the Lord was always with him, he determined in his spirit to see that truth with the eyes of his heart as he went through life, knowing that this would keep his faith strong. We say, “A picture is worth 1000 words.” I believe that is because pictures are the language of the heart. We notice that Jesus used pictures constantly as He taught (Matt. 13:34). When I use pictures in my prayer time, fixing my eyes on Jesus, I am speaking the language of my heart and that moves me quickly into heart/spirit realities getting me beyond my mind. Use godly imagination: So I choose to do what King David did and I develop “godly imagination,” which I define as “picturing things God says are so.” Obviously if I am picturing that Jesus is NOT with me, that would be picturing a lie, which is unwise. I can’t imagine any reason I would want to picture unscriptural things. So I see Jesus at my right hand, always. I add to this Paul’s prayer for God to enlighten the eyes of my heart (Eph. 1:17,18). Then I tune to the flow of the Holy Spirit, and He brings the scene alive. I find I can step from these godly imaginations, into a divine vision. It is amazing, simple and child-like! Of course it would need to be, as we are told that to enter the kingdom we must become as little children. My 6-year-old granddaughter can do this and she shares with me her journaling and the visions of the angels standing on both sides of her protecting her and watching over her. You will find your young children can do these four keys easier than you can! Try it with them and see. From Genesis to Revelation God gave dreams and visions, and He specifically said that in the last days He would pour out His Spirit and we would see dreams and visions (Acts 2:1-4, 17). We must look if we want to see! Daniel saw a vision in his mind and said, “I was looking…I kept looking…I kept looking” (Dan. 7:2,9,13). So I needed to repent for not looking, and begin presenting the eyes of my heart to the Lord, and looking. As I pray, I look for Jesus, and I watch and listen as He speaks to me, doing and saying the things that are on His heart. Many Christians will find that if they will only look, they will see flowing pictures, in the same way they receive flowing thoughts. Jesus is Emmanuel, God with us (Matt. 1:23). It is as simple as that. You can see Christ present with you because Christ is present with you. In fact, the vision may come so easily that you will be tempted to reject it, thinking that it is just you. But if you persist in recording these flowing pictures, your doubt will soon be overcome by faith as you recognize that the content of them could only be birthed by Almighty God. A lifestyle: Jesus demonstrated the ability of living out of constant contact with God, declaring that He did nothing on His own initiative, but only what He saw the Father doing, and heard the Father saying (Jn. 5:19,20,30). What an incredible way to live! Is it possible for you to live out of divine initiative as Jesus did? Yes! It is called “abiding in Christ” (Jn. 15). Fix your eyes upon Jesus. The veil has been torn, giving access into the immediate presence of God, and He calls you to draw near (Lk. 23:45; Heb. 10:19-22). “I pray that the eyes of your heart will be enlightened” and you will see His visions. They are His gift to you, freely given (Acts 2:17). Key: Journaling, the writing out of your prayers and God’s answers, brings great freedom in hearing God’s voice. God told Habakkuk to record the vision (Hab. 2:2). This was not an isolated command. The Scriptures record many examples of individual’s prayers and God’s replies (e.g. the Psalms, many of the prophets, Revelation). I call the process “two-way journaling,” and I have found it to be a fabulous catalyst for clearly discerning God’s inner, spontaneous flow, because as I journal I am able to write in faith for long periods of time, simply believing it is God. I know that what I believe I have received from God must be tested. However, testing involves doubt and doubt blocks divine communication, so I do not want to test while I am trying to receive (Heb. 11:6). With journaling, I can receive in faith, knowing that when the flow has ended I can test and examine it carefully, making sure that it lines up with Scripture (1 Thess. 5:21). Remove doubt: Doubt may hinder you at first, but throw it off, reminding yourself that recording God’s words and visions is a biblical concept, and that God is present, speaking to His children. In the Bible, satan is constantly casting doubt by saying, “Did God really tell you…?” (Gen. 3:1 GNB). Learn to relax! When we cease our labors and enter His rest, God is free to flow (Heb. 4:10). Sit back comfortably, take out your pen and paper (or computer or iPad), smile, and turn your attention toward the Lord in praise and worship, seeking His face. Write down, “Good morning, Lord! I love You. What do You want to say to me?” Then become still, fixing your gaze on Jesus. You will suddenly have a very good thought. Don’t doubt it; simply write it down. Later, as you read over your journaling, you will be blessed to discover that the content is amazing and that you are indeed dialoguing with God! Hear God through illumined Scripture: Knowing God through the Bible is a vital foundation to hearing His voice in your heart, so you must have a solid commitment to knowing and obeying God’s written Word. We are commanded to meditate on Scriptures (Josh. 1:8). As we pray over Scripture, we find verses leap off the page and hit us between the eyes. This is another very powerful way that God speaks to us. Regular scriptural meditation is commanded by God and is a must for the effective Christian life. Utilize spiritual advisors: It is also very important for your growth and safety that you be related to solid, spiritual counselors. All major directional moves that come through journaling should be confirmed by your counselors before you act upon them. The Bible says in the mouth of two or three witnesses every fact is to be established (2 Cor. 13:1). Also, in the multitude of counselors, there is safety (Prov. 15:22). So make sure you walk in meekness and seek out and receive input from your spiritual advisors. This step must not be skipped! 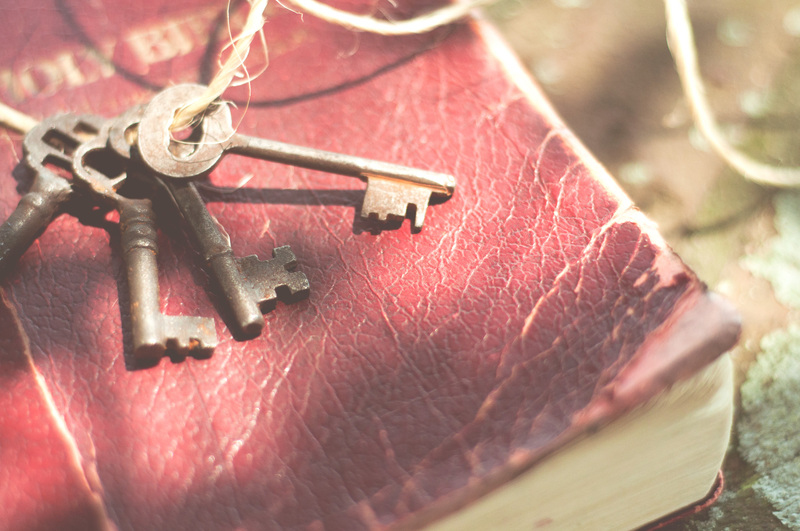 The four keys appear again in Revelation: John used the same four keys that Habakkuk did. In Revelation 1:9-11 we find he was in the spirit (stillness), he heard a voice behind him (tuned to spontaneity), saying, “Write in a book (journaling), what you see (vision).” So in both Old and New Testaments we find the same four keys being used to receive God’s voice. Don’t worry about the order of the keys. Just make sure you are using all four keys. As a PACKAGE these four keys work (Stop! Look! Listen! Write! ): They get the job done! People hear. We guarantee that if you will use these four keys together, they will work for you and you will hear God’s voice. Try them as a bundle, and see how they work for you. We have free downloadable music you can listen to as you journal. It is available at www.cwgministries.org/galilee. The first part of the recording takes you for a visionary walk with Jesus along the Sea of Galilee, and guides you into using all four keys together. We encourage you to give it a try! May you be restored to taking walks with the Lord in the garden in the cool of the day. May you experience the fullness of a personal relationship with our Lord and Savior, Jesus Christ. May communion with God be deepened in your life, and may His healing and creative rays fill you through and through. Keep your focus on hearing and seeing Jesus throughout the day with this continuous reminder of the Four Keys. Also, each monthly issue of God’s Voice Worldwide features new, inspirational conversations with God from people all over the world just like you. I was introduced to a course of study called Communion With God containing a real anointed teaching on drawing closer to God. It is the favorite of all our students and I don’t think I will ever have a school without it. Your manual on Communion With God is very, very rich and wonderful. I am going to study personally with it. I praise God for your ministry and wonderful contribution to the body of Christ. If you have written other study manuals, would you kindly send a copy of each one of them to me? The whole teaching on Communion With God has been a wonderful help as well as the Counseled by God teaching, has been of great personal benefit both to myself and to my wife, Carol. Dialogue with God is worth a million dollars to any Christian who is serious about the issue of hearing the voice of God. Mark’s teaching on this issue profoundly impacted my life. What you’ve just read merely scratches the surface of all you can learn about hearing God’s voice. There are so many things that can trip you up, stand in your way and try to stop you from accurately hearing from God. But there are also many, many more things that you can learn about how to hone in on God’s voice and become truly confident that you are in His will. Take that first step toward receiving God’s fullness in every area of your life by enrolling today and starting your educational journey with REN103 Communion With God. You won’t ever regret it.